At the beginning of this week I completed the neckband and then started on the sewing up, I have only sewn one side seam which I might end up undoing because it looks a little bit puckered to me. 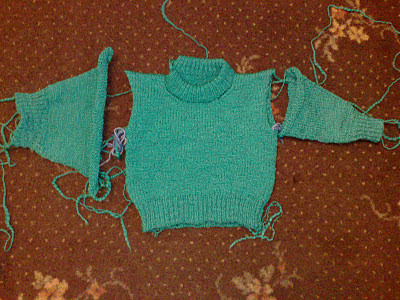 The main reason I haven't done much sewing of the sweater is because that huge stash of yarn was just staring at me and I couldn't resist not knitting anything with it lol, I put my 360 away and setup my lk150 and started knitting a little sweater for my nephew in this slub type yarn in a teal colour. The machine did struggle knitting the yarn a few times, I had it set on tension 6 and was thinking of changing it to tension 7 but then it would of been a bit loose for my liking where the yarn went thinner in some places so I just turned the tension mast dial up by one number and it knitted a little better. Here is the jumper, the neck band looks a little weird but never mind, I am not sure if it is because the back neck is shaped instead of the back neck just being straight, I will try and get this finished as soon as possible cause I really want to see it finished. Compared to me that's a considerable amount of progress! Can't wait to see them all sewn up. You work so quickly and so well. 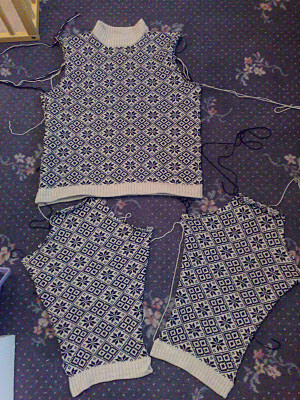 Thanks maureen I want to get it finished but for some reason I am loosing interest in the sewing up, I think I will get the hauge linker out.